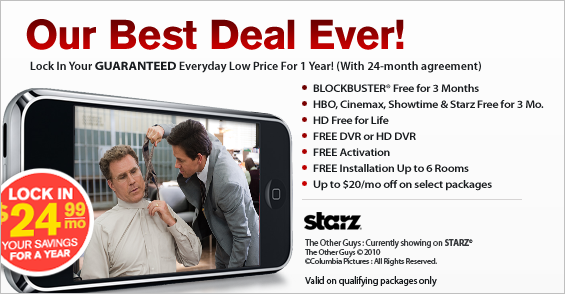 Don’t miss out on the best TV offers and deals for high definition TV from St. Louis DISH Network. There is no guarantee on how long they’ll be available or if it will ever be this easy and affordable again. Just call DISH Network in St. Louis or order online to guarantee that you get the best selection of HD programming in the area, and at the most affordable prices ever. When you subscribe to DISH Network you’ll get over 130 HD channels on the best programming package available. In addition to the basic packages is an incredible selection of premium movies, sports, and international packages for you to choose from to customize the perfect channel lineup for the entire family. All local channels in St. Louis, which includes local HD channels (if available in your area), are included with a basic DISH Network package. The wide selection of programming packages to choose from lets you customize your channels to what you and your family want to watch. With DISH Network’s flexible plans including the no-credit Flex plan and affordable basic packages, finding the perfect solution to any budgetary concern is simple. Best of all, DISH Network now offers new customers free HD for life on all qualifying packages (24 month agreement with AutoPay billing required). Call now and secure your free HD service from DISH Network today!